Murder mysteries have always been my guilty pleasure. As an awkward pre-teen I was a rapacious reader of the Nancy Drew series (more interested in her amateur detection than her fledging romance with Ned Nickerson), and over the last decade or so I’ve nursed a not-so-secret love for all things Agatha Christie. This hobby has always been a rather bloodless affair though. Save for a few years during my childhood when my father unwittingly purchased some rather gruesome true crime-style magazines for me, I’ve never delved very far into the seamy side of real-life, violent murders. Or, I’ve ensconced myself safely in the wrappings of history, enjoying Judith Flanders’s The Invention of Murder or Lucy Worsley’s A Very British Murder, while putting some serious space between myself and the otherwise-queasy events they describe. A new exhibition at the Museum of London (MoL), however, seemed to offer me an opportunity to learn more about crimes old and new in the safe and sterile setting of a modern museum. The Crime Museum Uncovered, which enjoyed a sell-out opener last weekend, is a major coup for the MoL. The exhibition provides an insight into more than 140 years of crime and detection, through the lens of materials produced and evidence collected during police investigations and court cases. It’s the first time that objects from the Metropolitan Police’s Crime Museum have been put on public display and the move has inevitably whetted people’s appetites. 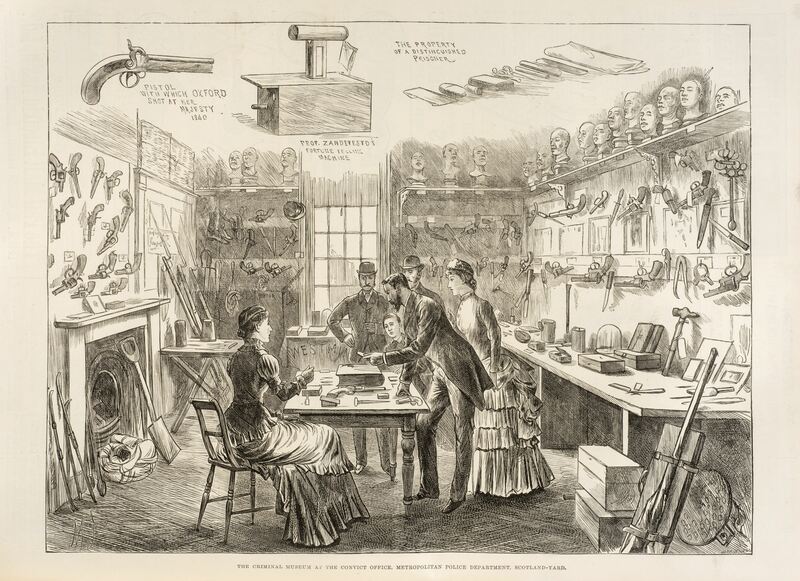 The Crime Museum (or Black Museum as it was once known) was established in the mid-1870s by serving officers. It functioned primarily as a teaching collection and was previously accessible only to police professionals and invited guests. The initiative to move the material into the public arena (temporarily, at least) has been co-ordinated alongside the Metropolitan Police Service and Mayor’s Office for Policing and Crime (MOPAC). Together, these partners have clearly expended a lot of effort justifying the decision to make the objects more widely accessible, but they inevitably remain self-conscious about the endeavour. As I braved the crowds earlier this week, I was curious about just what aspects of the exhibition had piqued everyone else’s interests. Were they interested in the history of detection, the rare opportunity to examine objects involved in murky murders, or a bit of both? The promotional blurb promises “an uneasy journey” through notorious crimes from the capital’s history. While it is quick to highlight that the exhibition explores felonies other than murder (among them the Great Train Robbery and the Millennium Dome diamond heist), it certainly seemed as though most visitors (and, admittedly, me among them) were eager to learn about the more violent and gruesome crimes. Moving about the exhibition space, we were drawn to what is effectively a gallery of murder and violence – a row of panels and display cases that narrate the stories behind twenty-four different crimes, including those perpetrated by such notorious and ubiquitous figures as Dr Crippen, the “Acid Bath Murderer”, and the Kray twins. One of the exhibition’s stated objectives is to “personalise” these all-too-often depersonalised crimes. In that respect, I’m not sure it is altogether successful. Inevitably the exhibition’s narrative is governed by the objects on display and often these tell us more about means than motive, perpetrator rather than victim. For each individual crime, the visitor is shown an assortment of objects that enabled detectives and coroners to crack the case. Among them are the spade used by Dr Crippen in the murder of his wife Cora in 1910 and the trunk in which John Robinson concealed the strangled body of Minnie Bonati in 1927. For each crime there is also a text panel, which offers a brief summary of the events that took place and how the perpetrator was foiled. In my view, these narratives didn’t always fully explore the events leading up to the murders and I was sometimes left wondering about motive. Was this ever established or did it remain unknown? I found this particularly frustrating in the curious case of Samuel Furnace, who faked his own death in the 1930s. He shot a younger acquaintance, Walter Spatchett, before burning the body and setting it up to look as if the remains were his own and that he had committed suicide. 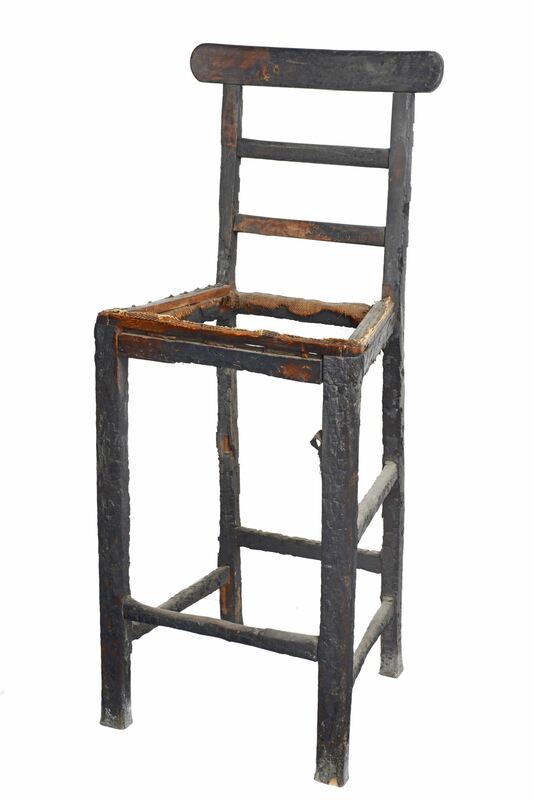 The exhibit features the charred chair on which Spatchett’s body was found. It’s a disturbing yet mesmerising object. Yet behind this unusual and brutal crime there is little sense of who Spatchett was and why he was targeted by Furnace. The cautious wording around the aims and intent of the exhibition also includes a brief allusion to the prevalence of violence against women. I wondered if this aside had been occasioned (at least in part) by the recent outcry over the Jack the Ripper Museum. While The Crime Museum Uncovered certainly takes a more sensitive approach to its victims, I’m not sure there was much significant analysis about domestic or sexual violence, though one undoubtedly comes away with a sense of its persistence and brutality. Nonetheless, I was pleased to note the way in which the exhibition usefully moves beyond our preoccupation with the Ripper murders. While early parts of the exhibition contain references to the police’s failed efforts to find the culprit and those men who were (at one time or another) suspects in the case, it offers a much bigger picture of late nineteenth-century crime and a broader view of violence again women as well. I was interested in the way in which various themes began to emerge during the course of the exhibition. In particular, it really conveys the way in which on-duty police officers have themselves become victims of violence. Visitors can learn about two WPCs who acted as decoys to catch a man responsible for a series of sexual assaults, and a group of three officers who were shot on duty in an attack that became known as the Shepherds’ Bush Murders (1966). That said, the exhibition doesn’t simply go in for a ‘heroes vs villains’ approach to the history of crime. For instance, in one section on public protest, it questions and problematizes the actions of police officers themselves, addressing the events that took place at the Cold Bath Fields and Broadwater Farm riots of 1833 and 1985 respectively. Another theme that the exhibition probes is the role of capital punishment. At the outset is a chilling display of nooses that were used in the executions of several high-profile criminals from the mid- to late-nineteenth century. Among them were robber and murderer William Seaman and Amelia Dyer, one of the period’s infamous ‘baby farmers’. It is a stark and effective display, though one that left me feeling decidedly queasy. Shortly afterwards the exhibition features an executioner’s box that was circulated among prisons for reuse with different convicts. Together the objects elide some of the tensions underpinning this form of punishment – both its theatrical and bureaucratic elements. The exhibition narrative also emphasises the way in which execution shifted from the public to the private sphere and changing public attitudes towards its usage. I was particularly interested to learn more about the convictions of David Bentley and Ruth Ellis, two figures who proved crucial in the move towards the abolition of capital punishment. Bentley was executed in 1953 for his part in a robbery which led to the murder of several police officers. There was considerable public unease about his conviction and sentencing, given that he not only acted alongside another young man (who, despite firing the shots, was too young to face the death penalty) but also had intellectual disabilities (in the terminology of the day he was verging on feeble-mindedness). Eventually Bentley received a posthumous pardon in 1993. Ruth ElIis, meanwhile – a nightclub hostess turned manager – was the last woman to hang in England in 1955. She shot her former lover, the racing driver David Blakely, who had previously caused her to miscarry by punching her in the stomach. In both these instances, the exhibition offers greater insight into the perpetrator’s stories. However, I was curious that it framed public resistance to Ellis’s execution primarily as discomfort towards hanging women. I was interested to know more about the way in which public sympathy might have been elicited by her experiences of domestic violence. In my view, the personal threads of these stories could perhaps have been drawn out more successfully if the exhibition had focused on fewer crimes. By profiling as many as 24 the narrative seems to lack focus and analysis at times, though it is undoubtedly able to offer a transhistorical perspective of crime and detection. Each crime is positioned as a landmark case or as marking a decisive shift in the development of new procedures and techniques, in a trajectory that encompasses forensics and psychological profiling. However, I feel this evolution could be foregrounded even further. Nevertheless, it was also interesting to reflect on the persistence of other tropes, including the crucial role played by chance discoveries from passers-by or tiny fragments forgotten by murderers plotting even the most elaborate of crimes. It should be emphasised that while the gallery of murderers and violent crimes inevitably attracted attention, the exhibition is much more diverse than this. As mentioned previously, there are sections dedicated to other crimes as well, including robberies, public protests and acts of terrorism. (I was fascinated to see how makeshift many of the explosive devices appeared to be.) Overall, I felt that there was a conscious effort by the curators to make these other displays more than purely tokenistic gestures to other types of crime. However, smaller displays on themes such as drugs and abortion were arguably less compelling – while they contain some fascinating objects they involve no personal narratives of perpetrators, victims or detection. I found it interesting to reflect on the way in which our experience of an exhibition is governed by the interplay between narrative and objects. The beginning of the exhibition is dedicated to the origins and early days of the Crime Museum, which is likely to be of interest to my fellow Victorianists. The curation is inspired by illustrations of the Police Museum (as it was then called) in the early 1880s and 1900s. I would advise anyone visiting the exhibition to pick up the handheld guide as without it the early part of the exhibition is almost impossible to navigate, merely a smattering of loosely connected and difficult-to-identify objects. Among the items on display are one of the two pistols Edward Oxford fired at Victoria and Albert in 1840, death masks from offenders hanged outside Newgate Prison, and a series of court illustrations produced by William Hartley between the 1890s and early 1900s. I was also entranced by a series of anthropometric record cards from the late nineteenth century, each of which includes a photograph of and vital stats for a convicted criminal. A testament to the perceived value of phrenology, the record cards feature not only details such as height and hair colour but also face breadth and mid-finger length. Looking over them I was reminded of Dr Guy Woolnough’s fascinating paper at the BAVS Annual Conference this summer, which explored the use of photography in the Victorian criminal justice system. A touch screen allows visitors to explore the Crime Museum Visitors’ Book, kept almost continuously since 1877. Among the entries are familiar names such as Gilbert and Sullivan, Harry Houdini, and Arthur Conan Doyle. There’s even an entry for the Australian Cricket Team! Browsing this fascinating record, it seemed to me that the objects had long functioned as entertainment for curious onlookers and that an uneasy alliance between sensation and education was indeed woven into the very fabric of the Museum. While the beginning of the exhibition looks back at the Museum’s origins, the final part is a reflection on the practicalities and ethical implications of bringing this material into the public domain. A darkened theatrical space, with several large screens and generous seating, has been set aside to enable visitors to watch a short film featuring commentaries from many of those involved in bringing the exhibition to life. After the jostling, claustrophobic atmosphere of the other sections of the exhibition (as someone recovering from eye surgery, I can say it wasn’t the most accessible of spaces) it offers some much-needed respite for personal reflection. For some, it may seem merely an afterthought or add-on (one that’s all too easy for the weary visitor to flit by on their way to the gift shop), though in other ways it’s a useful opportunity to confront our own responses to the exhibition retrospectively. Ultimately, for me, The Crime Museum Uncovered was an engaging insight into the history of crime, violence, and detection in the capital. As someone interested in its central themes, I considered it an unparalleled opportunity to learn more about a curious and disturbing collection of objects. (For museum aficionados it is also fascinating to think about how objects acquire and retain meaning and the way in which exhibitions rely on an interplay between text and object.) Given that the items have been assembled in ad hoc fashion, it is clearly a challenge to present a coherent narrative and inevitably there are gaps or inconsistencies in the approach. There seemed to be some acknowledgment that the exhibition would have a sensationalist appeal but also a natural hesitancy or anxiety about engaging with this aspect of violent crime. However, given its allure rests chiefly on its objects and the previous secrecy surrounding them (though many of the cases themselves are, of course, already in the public imagination), it seems to me that the exhibition necessarily involves elements of spectacle. It is difficult to display a set of nooses used in public executions or a charred chair that once held bodily remains without inviting a visceral response from visitors, whether it be repulsion, fascination, or both. As I have suggested, it seems inevitable that the exhibition will oscillate between education and sensation – indeed one could argue that this has long been part of the Crime Museum’s raison d’être. Perhaps the exhibition could be more explicit about the way in which it plays upon these warring impulses of human nature. For it seems clear that despite changing attitudes towards capital punishment and violence against women, there are many correspondences between public responses to crime in the late nineteenth century and now. Unfortunately this has all too often involved eliding the personal stories behind the more notorious narratives. While the exhibition makes a heroic attempt to realign our ethical compass, it too revisits and repurposes many of the more sensationalist tropes as well. It is an uneasy alliance in which both curator and visitor become complicit. Images reproduced with kind permission of the Museum of London. Charred chair used by Samuel Furnace to fake his own death, 1933. 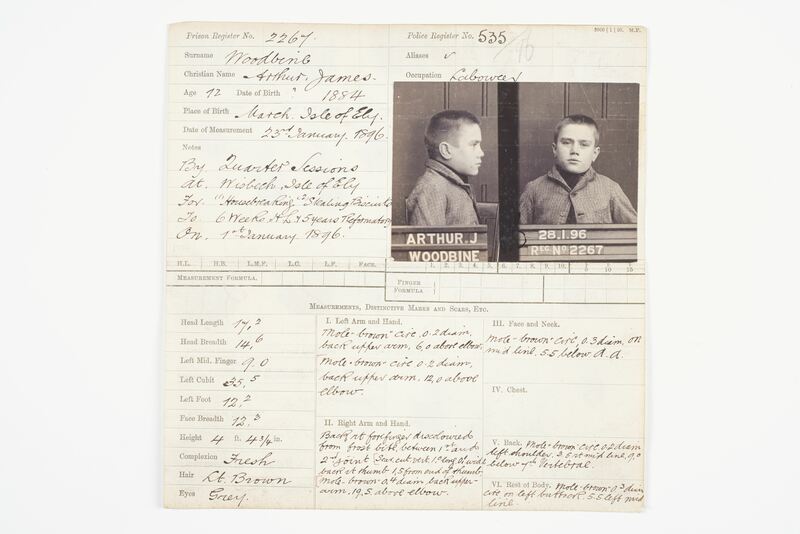 Handwritten criminal record card for Arthur James Woodbine, aged 12, 1896. The Crime Museum Uncovered runs until 10 April 2016 at the Museum of London. Admission prices vary. From £10 for adults (online/Wednesdays) / from £8 for concessions (online/Wednesdays).